Kampa Park, one of Prague's finest restaurants, is set in an exclusive location beside the river on Kampa Island, next to Charles Bridge. Kampa Park offers flamboyantly presented international fare, including fresh fish and seafood, wild game and innovative meat selections. 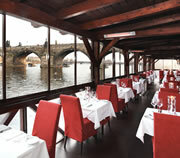 Bellevue, considered by many critics to be Prague's premier restaurant, is set in a chateau-like building by the river. 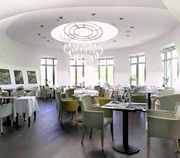 Bellevue Restaurant serves superb cuisine in elegant surroundings, whilst affording diners views of Charles Bridge and Prague Castle. Fine dining, including some of the best wines in Prague. 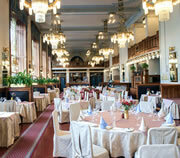 Francouzska Restaurant is set inside the stunning Municipal House. It is known as the most beautiful Art Nouveau restaurant in Europe. Experience early 20th century finesse; gold and crystal chandeliers hang majestically above tables dressed with crisp tablecloths, polished silverware and sparkling glasses. 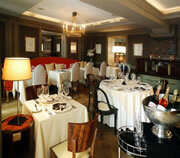 Coda Restaurant offers a true fine dining experience. The chef displays a masterful understanding of food, producing well balanced, innovative dishes, presented with flair and precision. 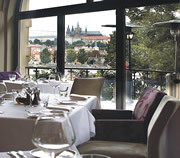 And the rooftop terrace offers panoramic views over Prague. Ideal for romance and special occasions. Live piano. 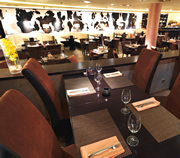 KOBE is Prague's premier steakhouse and sushi restaurant. A mouth-watering assortment of prime beef, lamb, fresh fish and sushi is on offer at this modern, comfortable restaurant on Wenceslas Square. TIP: Book a table through Prague Experience and receive a free welcome drink. Set on the top floor of the famous Dancing House, Ginger & Fred is a stylish, air-conditioned restaurant with a delightful menu and magnificent views over Prague. Prague Castle, the Vltava River and Charles Bridge all lie before you in panoramic splendour. In the summer, guests can dine on the rooftop terrace. La Casa Argentina brings the tastes and ambience of South America to the Old Town. 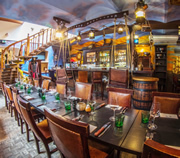 This large restaurant is full of ambience and offers an array of delicious grilled meats (cooked al asador or a la parrilla), fresh fish and seafood. Live Latin bands play every night, as well as traditional South American dancers. An informal, authentic Italian restaurant in a beautiful location in the Lesser Town, next to a park and a gently flowing stream. It features an open kitchen and has a clean, modern and cosy feel. The cuisine is fresh, light and tasty, based on traditional Italian family recipes. Live acoustic music is performed several times a week. 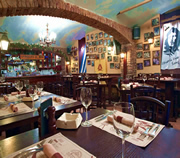 La Bodeguita del Medio in Prague is a lively Cuban restaurant and cocktail bar designed in the colonial style of Old Havana. The aromatic and flavoursome cuisine is South American and Creole, prepared by master chefs of Cuban cooking. There is live Latin American music, and a nightly Cuban dance show.